I started this morning still feeing somewhat irritated about the shifting problem. I tend to obsess about the details and if everything isn’t perfectly perfect, I can get a bit sideways. Jen reminded me again during our morning FaceTime to just let it go and get on the bike. Anyhoo, after breakfast, packing my gear and FaceTime, I was again on the road around 8:15am. It turns out that the fiddling I did with my rear derailer made it work good enough, that I was able to access all the gears I needed today. Yay for fiddling! The next guy I met was Wilson from Washington DC. He was headed to somewhere in Texas and he said he hand delivers hand written letters. Seemed awesome and he traveled super light! 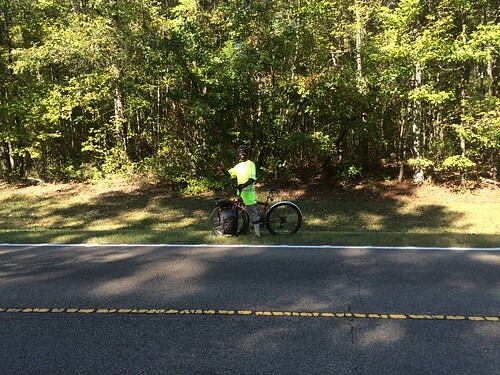 I saw two other fellows but traffic was heavy and we couldn’t pull over to chat which left me wondering about the official bike tourer etiquette (if any). How does one signal to the other that they’d like to chat other than the obvious, waving hysterically like a big dummy? Lunch was at a Chinese buffet in Houston MS which was 4 miles off the trace. The food was meh and totally not worth the 8 miles to get there but lunch options were limited on this section of the trace. After lunch, I got back into the zone and was in Tupelo before I knew it. 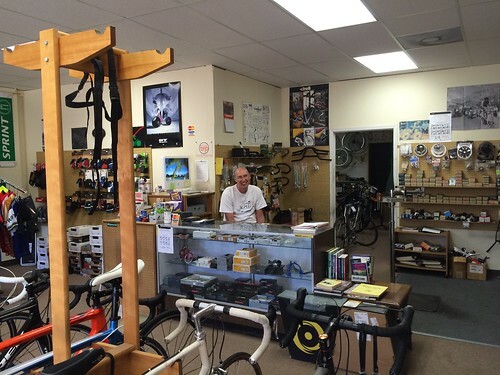 I stopped by Bicycle Pacelines and Bryan fixed me right up! Let’s hope this is the last of this issue. I decided to take my motel room option tonight and I’m currently sitting in a $45 room in Tupelo MS as I type this. I didn’t ask about hourly rates, but I bet they have them. I picked this place for two main reasons. 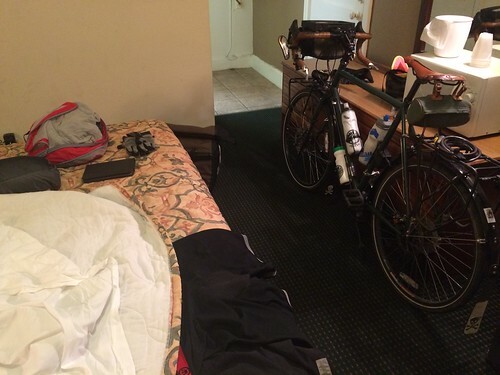 First, it was the first motel I came to after leaving the bike shop. Second, there was a steak house across the street called Woody’s. My steak dinner literally cost $10 more than my room. Priorities people. Today was awesome; the best I’ve had on my trip. That sounds like an awesome day. Glad you got your gears fixed up. And that big bus thing for camping, yeah that’s the only kind of camping I think I would like. Or a cabin. Or hotel. Keep up the good work buddy! I wanted you to know that even though we never met, I found out about your adventure and blog from your sweet wife. At this point I look forward to sitting down every night, waiting on your email notification to pop up with your update. To be physically and emotionally capable of putting up with such a trip simply earns my deepest respect. You have truly become a great inspiration to me over those short few days, in more ways than you can ever imagine. Stay safe and keep those updates coming and from the bottom of my heart: THANK YOU! I’m so happy for you and it looks like you’re doing great on the trip! Keep the updates coming, look forward to seeing them! Sounds like Wilson from DC is living my dream!